This tasty chicken is a whole meal in one dish, making it ideal for a busy weekend or weekday meal. It's economical, too. Cut a broiler-fryer chicken into halves or quarters and roast it along with the vegetables. 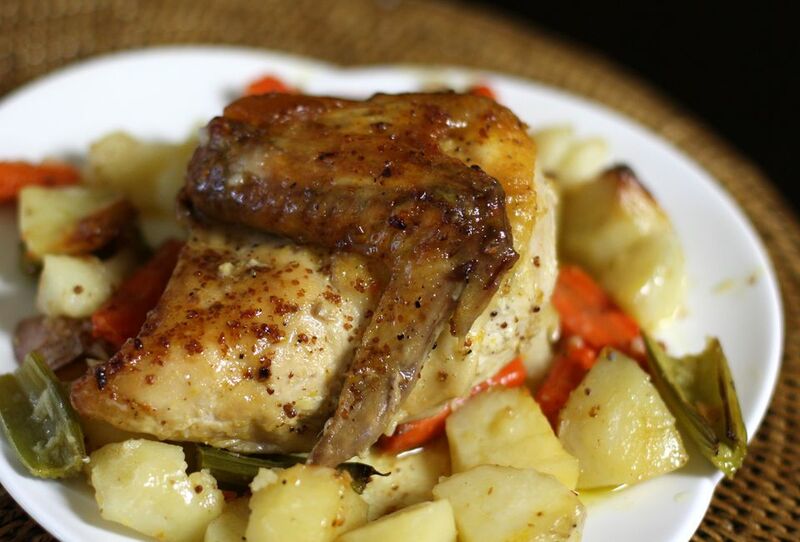 Garlic, olive oil, and basic seasonings flavor the chicken and vegetables. Yum. Lightly oil a roasting pan. Combine the 1 clove of mashed and minced garlic with the butter and a little fresh ground black pepper. Separate the skin of the chicken and rub some of the butter and garlic under the skin of each of the chicken pieces. Arrange the chicken in the roasting pan. Combine the potatoes, carrots, and celery in a bowl. Toss with the olive oil and 3 cloves of minced garlic. Arrange the vegetables around the chicken and sprinkle the chicken and vegetables with salt and pepper. Pour chicken broth into the roasting pan. Roast the chicken, basting occasionally, for about 1 1/4 to 1 1/2 hours, or until it registers at least 165 F on a food thermometer inserted into the meaty part of the thigh. * Add more chicken broth, if needed. *According to foodsafety.gov, chicken must be cooked to at least 165 F on a food thermometer inserted in a thick part of the chicken, not touching bone or fat. To cut a chicken into halves, cut out the backbone (discard it or freeze it for stock or soup). Slice through the center of the breast to make 2 halves. For quarters, separate the leg and thigh from the chicken; cut through the hip socket. Then cut the backbone out and slice the breast in half. You'll have 2 whole legs (with thighs) and 2 split breasts with wings attached.